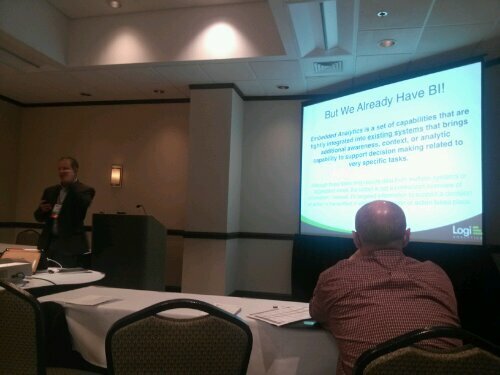 This week I did a little travel and went to Durham, North Carolina to present at the 2013 East Coast Oracle Users Conference (aka ECO). While I have been aware of this event for over 20 years, it is the first time I have attended. It was worth the trip. 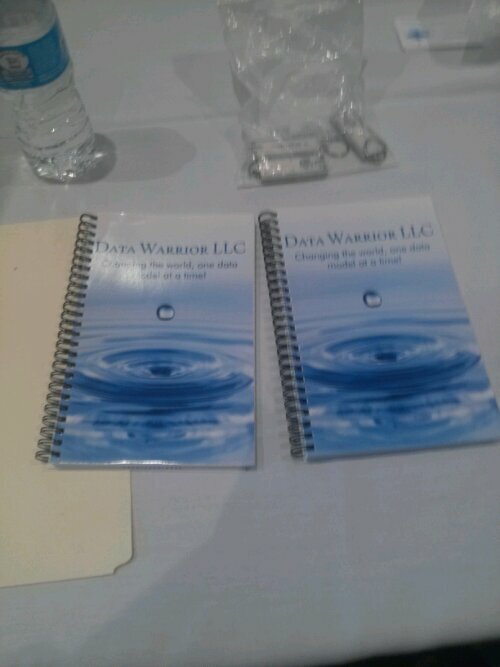 (Thanks to Jeff Smith at Oracle for alerting me to the event and encouraging me to submit). He actually sent me, Danny and Sarah (The EPM Queen). It was great to have members of the ODTUG clan together. 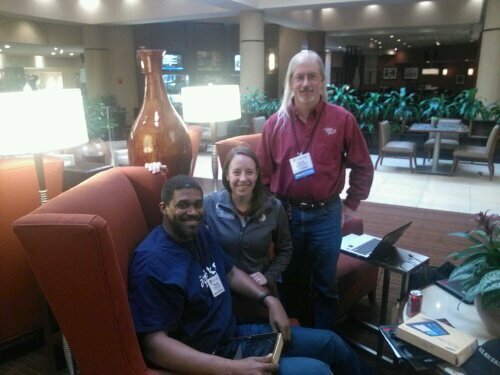 The gang of three – ODTUGers at ECO13 thanks to That Jeff Smith guy. Yea – he sent us! Overall a well run event held at the Sheraton Imperial Hotel and Conference Center. It drew over 300 attendees and a large list of Oracle ACE and ACE Directors were there to present to a crowd very eager to learn and network. 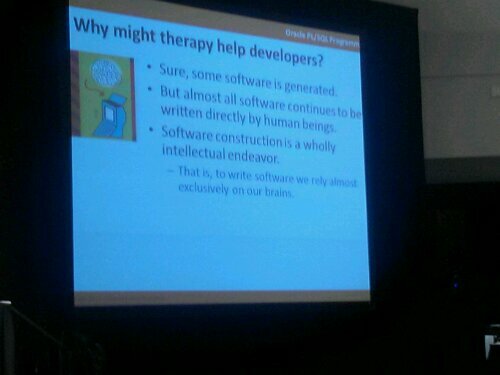 Our opening keynote from Steven Feuerstein (inventor of the PL/SQL Challenge) was a fun take on different types of therapy and how they might be applied to software developers. It was a fun, light way to start the conference with some very valuable advice. With that he got into all sorts of v$ view stuff that went mostly over my head. Needless to say I will have to download the slides from his site (orapub.com) and give them to someone more attuned to this kind of tuning than I! The second presentation Craig gave was called Understanding Oracle CPU Consumption: The Missing Link. Again lots of views and some Linux OS utilities (e.g., perf) and lots of numbers were displayed and discussed to try to ferret out how to determine what Oracle functions were actually taking up CPU time. 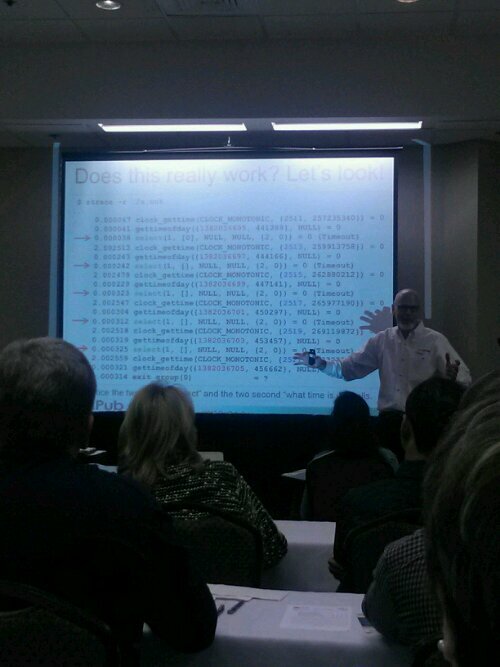 Even though I don’t really understand a lot of this (hey, I am a data modeler, not a dba right?) I like to go to sessions like this as I enjoy listening to smart people talk passionately about the things they do, and I figure I might retain just enough to point someone else in the right direction in the future, even if it is only to give them a copy of these slides! 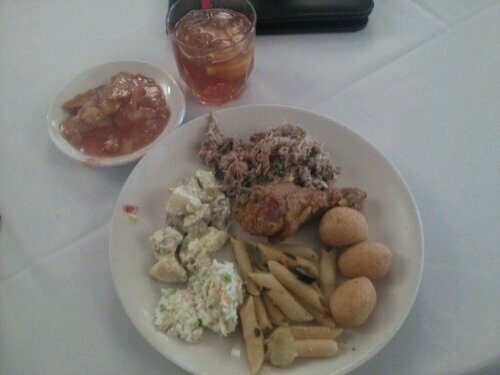 I love all kinds of BBQ and the pulled pork did not disappoint. I do not usually like fried chicken but figured I should try it and was pleasantly surprised. Crisp and moist. Very nice. 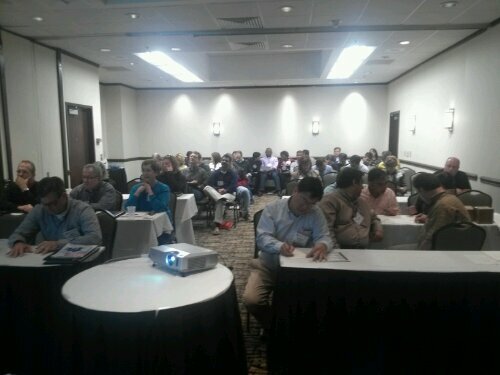 I had the best turnout ever for this topic with over 40 people in the session most of whom were game to try my gamification of data model review sessions. One of the tasks was to translate relationship sentences and model descriptions into Haiku (or another form). There were prizes as an incentive to play along. Made employees all look askance. The data model we used had the entities: Country, Region, Employee, Locations, and a few others. Keynote today was about eBusiness suite stuff. I sat there after breakfast mostly not listening as I started to put this blog post together. Then I did my 2nd talk. I had a somewhat disappointing turnout (only 5 people, sigh) but it was a great exchange with those 5 people. We had a very good discussion about applying agile techniques to building a data warehouse and I was able to introduce them to some of the details of Data Vault Data Modeling. None of them knew much about data vault, but some had heard the term. One attendee did tell me he was skeptical about the approach when he came in as he was a traditional Kimball dimensional data warehouse guy. But after the session he was willing to concede there was some merit and ideas he had not seen before and he was going to take those into consideration as he embarked on a new phase of his project where there were some complex problems to solve. He could see that data vault might just help. Really can’t ask for more than that! Level 1: Gateway Analytics – Operational applications have a report tab or menu item to launch the BI reporting tool interface. Maybe there is a login pass through. Level 2: Inline Analytics – at this level, the analytics and BI tool has been incorporated into the operational application interface to the point it has the same look and feel and you can’t tell it is a separate product or tool. This where many organizations are today. Level 3: Infused Analytics – this is the goal. At this level the analytics are truly part of the application and provide core functionality. Examples of this are the recommendations you get on Amazon as you check out or the movie suggestions you get on Netflix based on your prior movie choices. If the analytic pieces were removed the application would not function correctly. Well that’s it for this conference. Put ECO on your radar for 2014. P.S. Next conference on my agenda is RMOUG TD 2014. Let me know if you will be there. This version of the East Coast Oracle Users Conference is the second conference by that name. This one has been done under the ECO name for about two or three years, and under other names for a few years before that. The original ECO was a joint project of the Mid-Atlantic Association of Oracle Professionals (MAOP), the New York Oracle Users Group (NYOUG), and a few other local Oracle user groups on the east coast. It ran from 1991-2000 and died in the fallout from the 2000 bursting of the web 1.0 bubble. I presented at every ECO, except the 1994 conference. It was managed by our friends from YCC. There’s a sad story in the end of the original ECO, but I am not privy to the details.